First of all, if you just want to see some actual examples, real world stuff, click here to look at our projects. They don't always go as planned (Dennis is a UV guy, not a wood worker) but they have lots of photos and will give you insight on what to expect. Example of some quick tests, click for a closer view.Aging wood or other materials is one of the fastest growing segments of the UV lamp market. Of course, the sun is a great source of aging wood and such, if you have the time. Tanning lamps are acceptable, but they aren't optimized for aging and require very specialized ballasts and home made fixtures. We have 6 foot lamps that do a great job because they are optimized for non-human exposure, so we can retrofit your existing rig, although most people are using our new 4 foot lamps. The Universal UV is a common lamp for aging wood. It has a wide band output, covering UVA and UVB. It is a more harsh lamp, and gives realistic results. Our Curall 365 is really a curing lamp for fine finishes, but some people use it for aging materials. It is the opposite of the Univeral UV, it is a narrow band lamp, with all the energy in the 365nm range. It should give a more filtered look, like wood that has been aged over years through glass. Glass filters all the UVB and much of the UVA, which is why wood ages differently indoors than out. Which you choose will depend on your needs, although the Universal is the best all around lamp. The most proven lamp for true sun-like qualities is the SG-1 series of lamps. The four foot SG-1-40 is the most popular. It isn't quite as harsh as the Universal UV, but it has more UVA than either the Curall or the Universal, where the real oxidation takes place. It can be run at much higher wattages as well. It will operate as low as 32 watts, but really shines at 45 to 80 watts. It is a T12 lamp, meaning it is 1.5" in diameter instead of 1", so it has much more surface area to create UV, and it dissipates heat better. They cost a little more, but they have around twice the life, so they are actually the least expensive bulb to operate. Our 4 foot lamps are different than anyone's 4 foot ultraviolet in that they are multiwatt capable. The T8 lamps use 500ma lamp ends, the SG lamps use 1000ma lamp ends. The T8 lamps use a special UV transparent glass (Open Glass), and UV only phosphors. The SG lights use the patented Sol Glass technology and proprietary phosphors. All of our lamps are stronger because they are designed for producing UV only. As you can see, we have all the bases covered, with lamps for all applications. The T8 lamps are technically called "F32T8", which means 32 watts, but they can be run with as little as 25 watts, or as much as 60 watts. Standard light fixtures such as the 32w office light style fixture, or the 40w T12 fixture are fine. Powering them with a Workhorse 7 ballast gets you to the sweet spot, where these lamps really love to be, around 45-46 watts. The higher you power them, the shorter the life, but this 45-46w range is the best balance, and the most efficient that they operate in. Our gassing (the vacuum inside) is centered around this as well. Many hobbyists and professionals alike will start with an off the shelf light fixture, then upgrade the ballast later on, so it is a practical way to go. The SG-1-40 is the same length, but is a "F40T12", meaning the format is designed for 40 watts, although we test them at 100w. These four foot lamps can be used in any four foot fixture and ran at lower power, or they can be abused with super high wattages, and they will keep coming back for more. 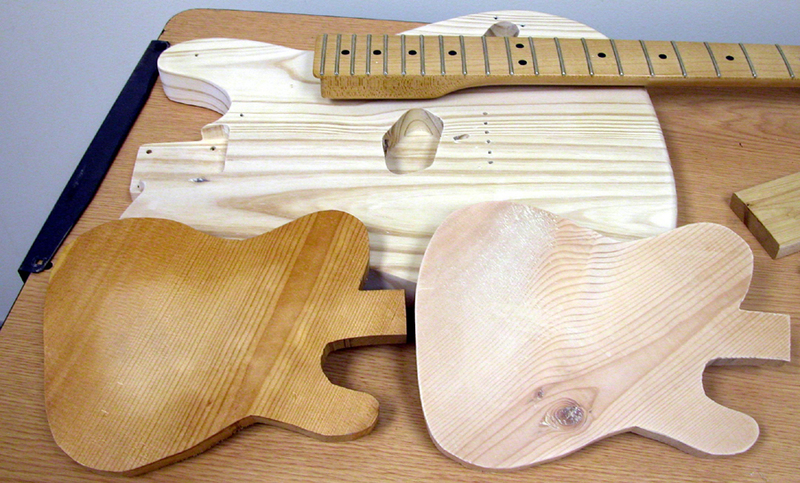 Left is about two days, center is none, right is about one day in medium power mode, click for a closer view.The top image is a simple example, with my unaged Telecaster project in the background with an actual Fender neck, a freshly sanded Mini-Telecaster to the right, and a lightly aged Mini-Telecaster on the left. This was my first experiment with doing a "sunburst" pattern, which I accomplished by cutting out a smaller paper version of the guitar body, and suspended it half way between the wood and the lights for a day or so. I then exposed the entire body to a about half a day's worth of UV. This doesn't show how to do it right, but it does show how easy it is and how effective you can be on your first attempt. All the raw wood is pine. The aged body had only a single coat of surfboard UV cure resin, no sanding. Both examples were cut from the same board of pine. The single board was a simple test I did early on using prototype lamps with both UVA and UVB, similar to the Universal UV lamps but with lower UVB. I simply cut a 1x3x8 pine board into lengths for testing, and put on a couple of thin coats of surfboard resin, no sanding. Not exactly high tech, but again it shows how the lamps give character to the wood tone. Every type of wood is different, and wood from different trees will vary as well. While we use science to get the job done, it is up to you to use art to get it done right, dialing in the exact right number of hours for the desired effect. The lamps are fairly quick, but still take enough time that the margin of error is pretty easy to work with. We have dozens of customers who are violin makers. This is a very special application. For this, we definitely recommend the SG-1-40 lamps, but instead of running them in VHO mode (Very High Output), we recommend running them in HO mode (High Output). This will be slightly slower, which really isn't an issue for violin making. More importantly, it will generate about half the heat, so you get most of the power with half the heat, which is important for working with wood veneers. This kit only has 4 lamps, which is fine for single surfaces, while most violin builders would use at least 3 of these kits for full on coverage. Low volume builders can rotate the violin, but it will take longer. This same kit is good for more than violins, it is good for any application where heat is really a major concern. By isolating the ballast outside of the aging chamber and providing an open or vented environment, it is trivial to reduce the concern to nothing. Most violin builders say they can finish a complete unit in a week or less, one coat per day, using these kits. These kits are very similar in that they use the same Solacure SG-1-40, out best oxidation and curing lamp, plus have 8 lamp holders. The big difference is in the ballasts used and power levels. The Violin Kit powers the lamps at around 45 watts each. The Cue & Lure Kit powers the lamps at around 60 watts each. The VHO kit powers the lamps at around 80 watts each. Higher watts means more output but more heat and a shorter life, so which kit you choose will depend on your needs and how fast you want to age wood.